The Mediterranean to the south, the Alps to the north. 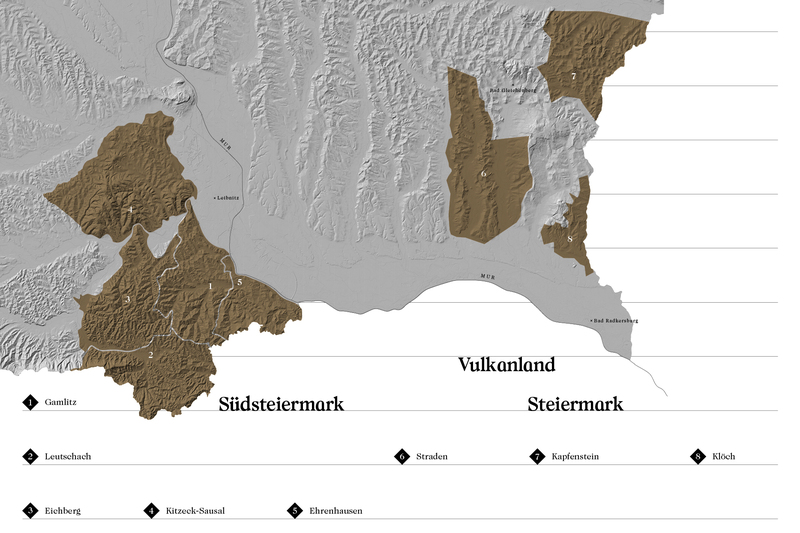 This describes notonly where the wine areas Südsteiermark and Vulkanland Steiermark are located, but also what influencesthem. 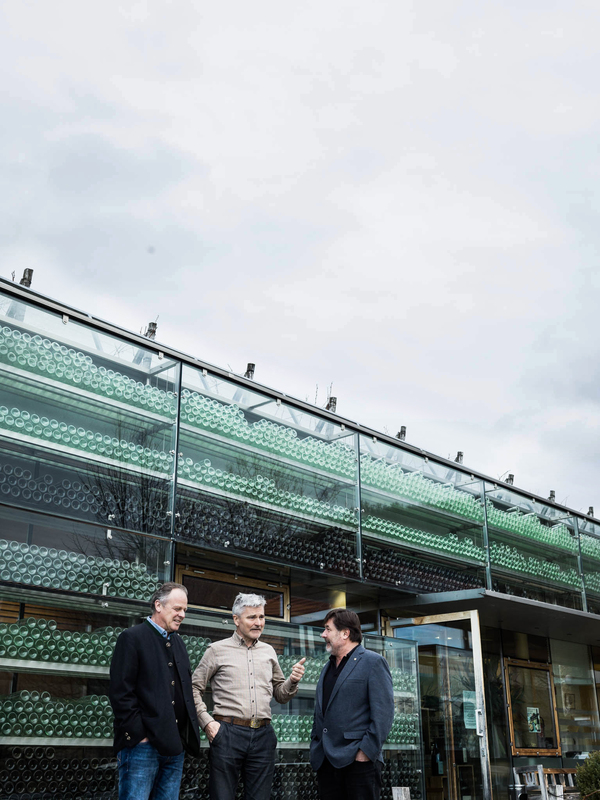 The wines produced here thrive under contrasting climatic influences. Mediterranean warmthcollides with cool winds and frequentrainfall. Steep to extremely steepslopes typify the region. Conditionsare certainly challenging, but they yield delicate wines of origin that are characterized by climate, soil and handcraftmanship. The name of the wine village Gamlitz stems from the Slavic term gom, meaning hill. The undulating landscape is marked with vineyards, meadow orchards and small mixed woodlands. Vines grow on steep slopes with elevations from 320 to 550 metres (1050-1800 ft.) and aspects that vary from east to south to west. Some sites are located in warm bowls, protected from the wind, while others are exposed hillsides that rise above the surrounding landscape. The foundations are sands that were created during a sedimentation process as the Paratethys Sea receded. 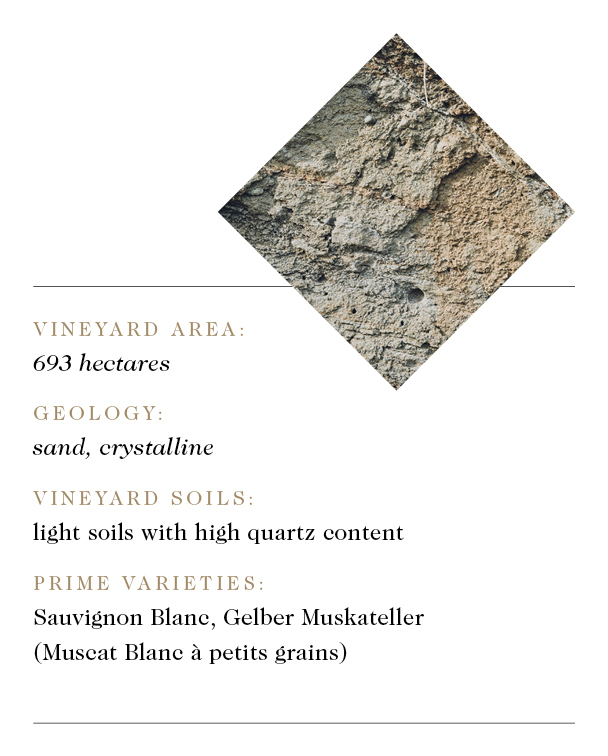 The sands are comprised of quartz, often mixed with mica, and provide well-drained vineyard soils that are usually free of calcium. The Steinbach and Kranach gorges are striking incisions in the hilly landscape that have significant influence on vineyard microclimates. They amplify the temperature differences between night and day, thus enhancing aroma development in the grapes. The vineyards in Leutschach are among the most southerly in the Steiermark and lie at elevations between 380 and 570 metres (1250-1870 ft.). The vineyards are located predominantly in steep, south-facing bowls that curve toward east or west. The geographic location is influenced by warm rising winds that collide with cool air masses from the Koralpe Mountains to the west. This results in large temperature differences between day and night as well as a nearly fog-free climate. 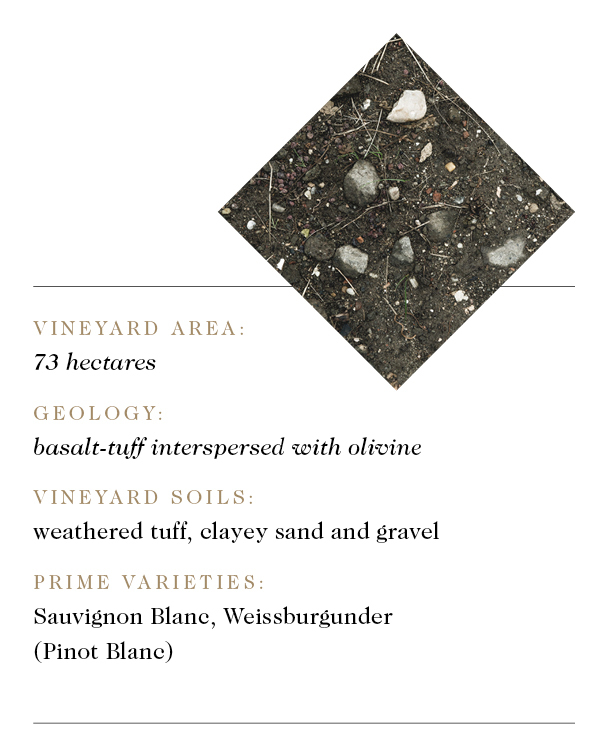 The soils are predominantly Opok, a calcareous, fine- grained sedimentary marl formed from 15-million-year-old marine deposits. Pebbles are sometimes interspersed. 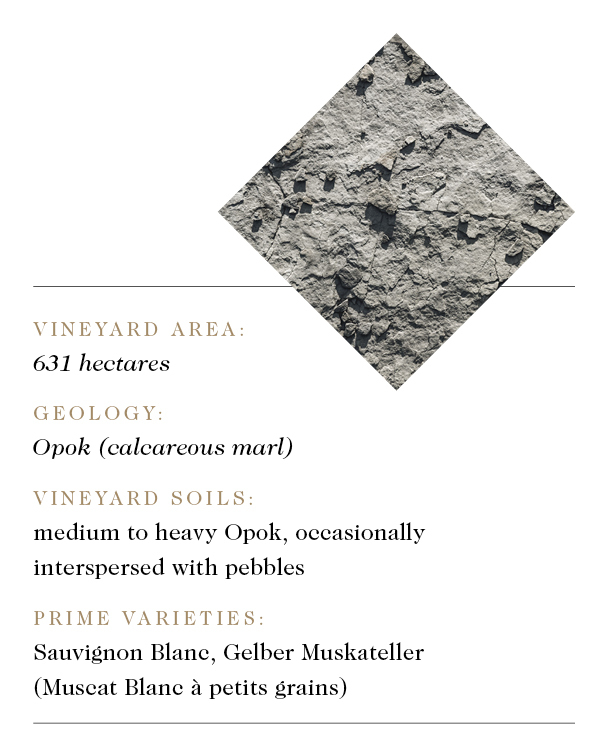 The medium to heavy Opok soils store warmth and moisture, offering optimal ripening conditions. 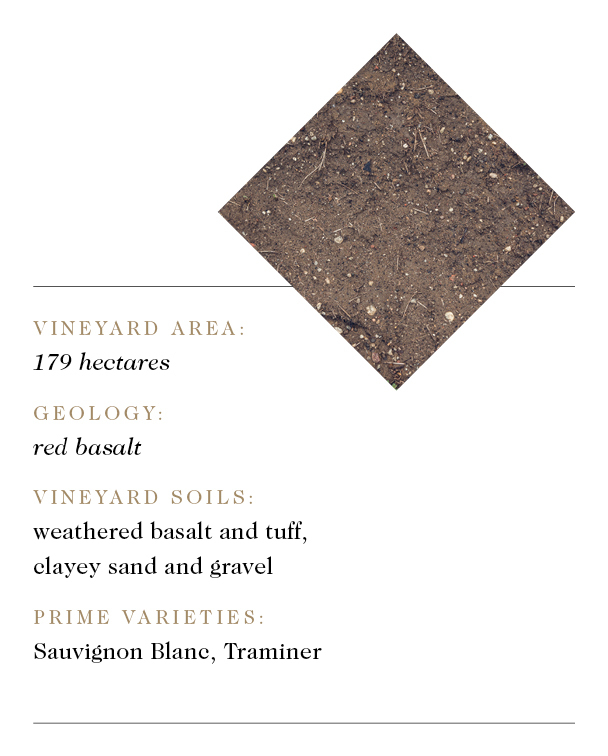 Combined with the great diurnal temperature fluctuations, the soils promote the development of spicy, dark aromas in the grapes. The Eichberg hills between Gamlitz and Leutschach rise from 380 to 600 metres (1250-1970 ft.), exposed vineyards with high peaks typify this community. On the highest peak, the 633-metre Kreuzberg, there is a watchtower with a viewing platform that offers a spectacular view over southern Steiermark. 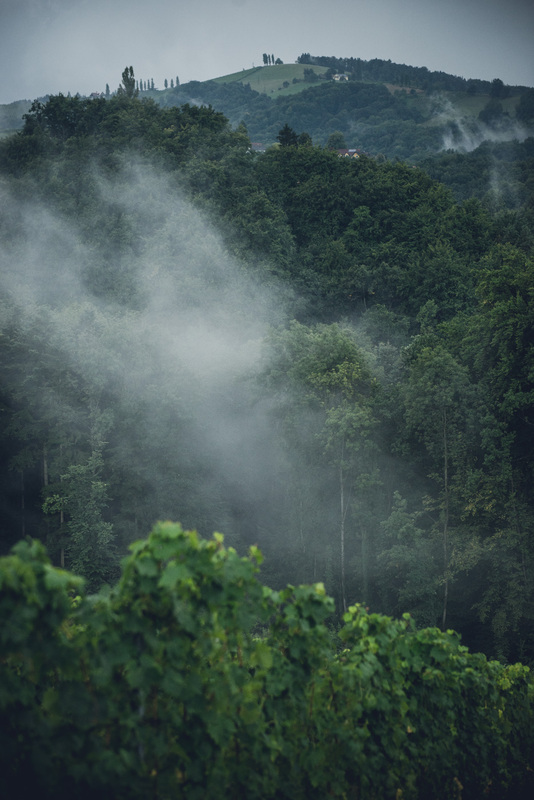 The vineyards in Eichberg are often near cool forests and the proximity of the Koralpe Mountains also influences the cool microclimates of the individual sites. 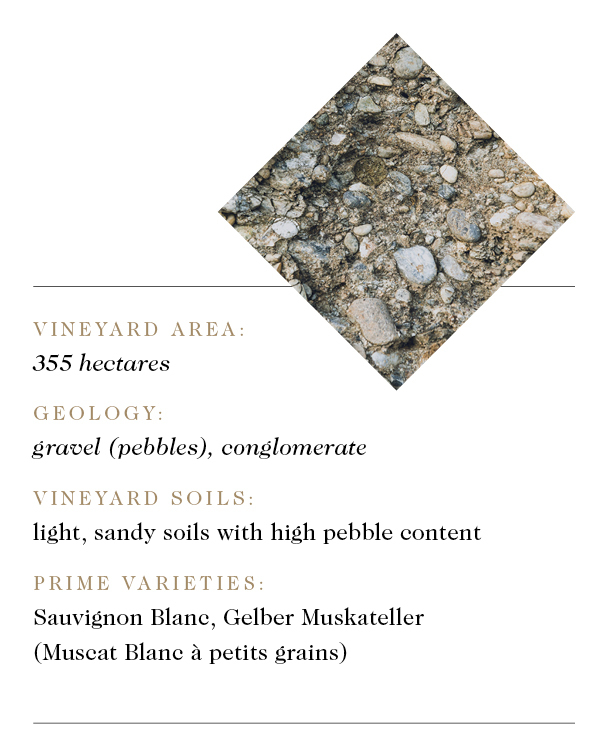 The soils were formed in a sedimentation process similar to Gamlitz, but they have higher pebble content. Sand and pebbles are often consolidated to gravelly conglomerate. Grapes that grow here have crisp aromas and ripen comparatively late, which leads to moderate alcohol content in the wines. The geology of Kitzeck-Sausal was formed around 400 million years ago. When the Paratethys Sea covered the region around 15 million years ago, this mountain ridge still rose above the surface of the shallow sea and marine deposits were left only on the lower slopes. The landscape is thus craggier, which is particularly evident in the impressively steep slopes and numerous vineyard terraces around the village Kitzeck. The difference in elevation between the top and base of a vineyard slope is usually over 200 metres (660 ft.). Most of the vineyards lie between 380 and 650 metres (1250-2130 ft.), which promotes good vine aeration. Weathered slate and occasionally schist provide porous, well-drained soils that store warmth well. The harvest usually takes place late in Kitzeck-Sausal, which promotes cool, spicy aromas and good acid structure in the grapes. The most south-eastern wine village of Südsteiermark with its pretty manor houses and prominent castle is regarded as the entrance gate to the Südsteiermark Wine Route. The vineyards are located high above the historic old city centre. The mighty hills rise adjacent to the Pannonian Basin and the Mur River. The steep, mostly south-facing vineyards open generously and lie between 300 and 530 metres (980-1740 ft.). The Paratethys Sea covered Südsteiermark 15 million years ago. Remains of coralline algae and coral reefs can be seen in ex- posed rock faces in the vineyards. 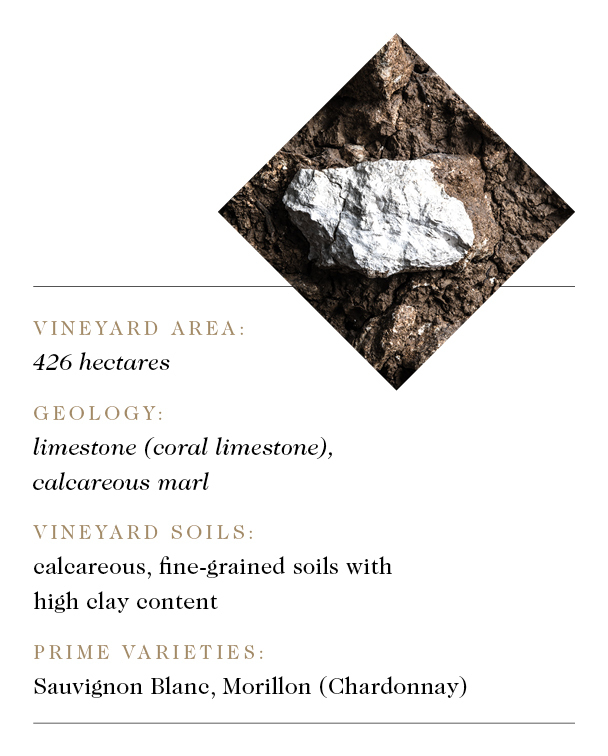 Through later sedimentation and erosion processes, fine-grained calcareous soils with high clay content were formed that provide ideal growing conditions for vines. Grapes achieve high ripeness with spicy aromas and ripe acid structure. The over 800-year-old wine village Straden and its church sanctuary, enthroned in the middle of the southern part of Vulkanland Steiermark, are visible from afar. The landscape of the area surrounding the village is characterized by the remains of an ancient gravel bed and the foothills of the extinct volcano, Stradener Kogel. The vineyards are scattered like islands on steep slopes and elevated plateaus around the historic market village and lie between 300 and 440 metres (980-1440 ft.). 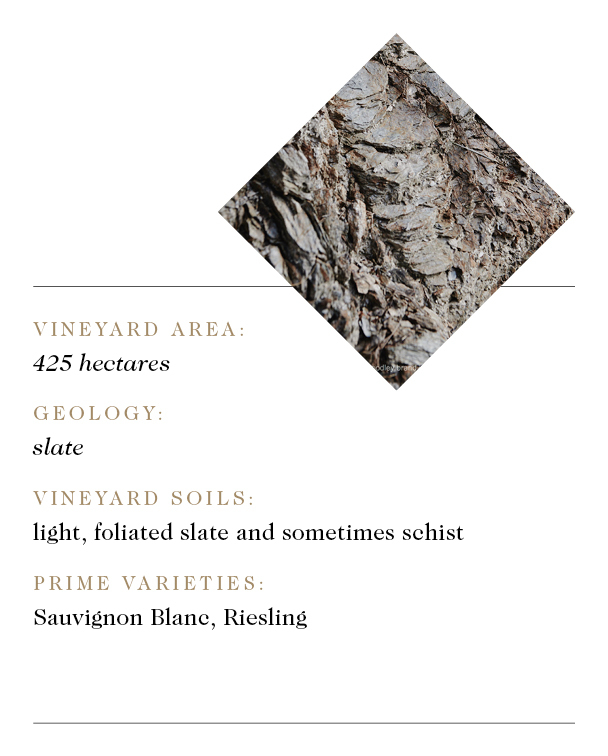 Vines root either in meagre soils stemming from calcareous marine sediments and gravel deposits from the Alps, or in weathered basalt soils on the foothills of the Stradener Kogel. Grapes achieve harmonious ripeness and yield rich, well-structured wines. The extinct Kapfenstein volcano and its striking 11th-century castle dominate the landscape between Bad Gleichenberg and Fehring. The steeply rising Kuruzzenkogel is another volcanic cone in the vicinity. To the northwest, near the Bertholdstein Castle, the landscape rises once again before it drops to the floor of the Raab Valley, the northern limit of the village community. The geology of the extinct volcanoes is predominantly basalt-tuff that is interspersed with olivine gemstones. Toward the foot of the hills, the soils become deeper with increasingly clayey marine sands and river gravel. Influenced by a Pannonian-Illyrian climate, potent, harmonious grapes thrive in Kapfenstein. The old wine village Klöch in southeast Vulkanland Steiermark is located in a valley that opens toward the south and is flanked by extinct volcanic cones to the west and east. The over 600-year-old Klöch fortress ruin perched above the village serves as an event venue and vantage point over the hilly landscape to the south. Basalt dominates the west side of Klöch, while on the east side there is more tuff. Due to the high iron content, the basalt and tuff are reddish in colour. 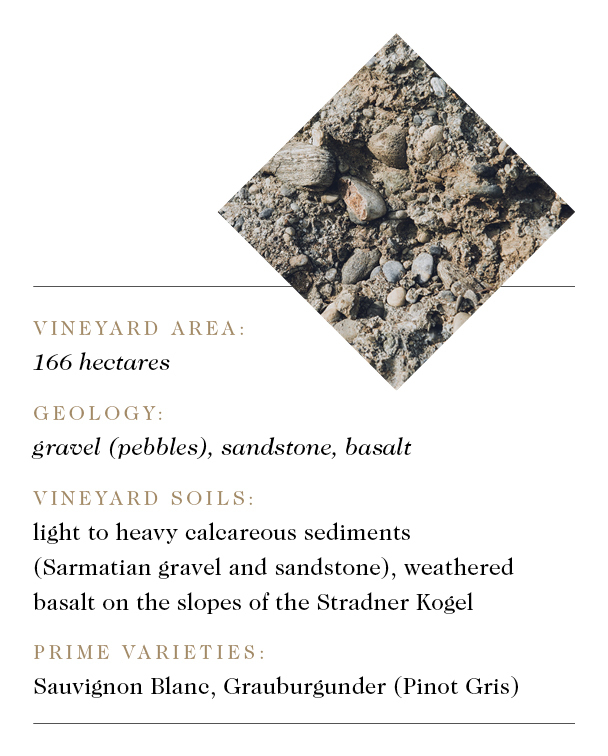 The Klöch microclimate is highly influenced by the warm Pannonian Basin and yields powerful Traminer. This grape variety is the local specialty and is produced at every winery in styles ranging from dry to noble sweet.